Notes on Wyclif from O’Donovan. A running series of notes I’ve made on John Wyclif over the past decade, with help from Oliver O’Donovan. God exercises his Lordship by “communication,” lending (not giving away, since God cannot alienate himself), by giving fellowship (communication) to human beings. God shares creation as a whole with mankind as a whole. What is man’s response to this communication? For Wyclif, every righteous man is lord of the whole world, and in receiving anything we receive the whole world with it. Communicating the good of creation with each other, we discover a radical equality in our creaturely relation to God’s communication. Summed up in this formula: This mine is ours. Evangelical lordship is the “natural, nonproprietary use of necessary things universally open to human beings” (484). Following Augustine, Wyclif will argue that a just lordship of earthly goods involves a rightly-ordered love towards them, which depends on a true knowledge of them available only in Christ (485; cf. Augustine City of God, BK 19). Does this mean that we can overthrow tyrants since they don’t have a Christological understanding of rightly ordered loves, and hence no just lordship? Not so fast, Wyclif would say, it is true they do not have just lordship, but we as those having true dominion in Christ bear witness that they have a “defective use of these goods” (Wyclif, 494). Tyrants posses “an unformed power” (Wyclif 510) but not true lordship. Rather, it is the believer who has the epistemological authority to judge the failures of church and state (O’Donovan 483ff). “God communicates them (spiritual gifts) to mankind with no alienation or impoverishment to himself the giver” (Divine Lordship, bk. 3 ch. 1. 70c). Outline from Bonds of Imperfection eds O’Donovan and O’Donovan (Eerdmans). Key point: The possession of rights is always proprietorship; all natural rights (for the West) originate in property rights (Joan Lockwood O’Donovan, 75). This originated with Pope John XXIII (1329 AD). He saw man as created with full lordship and ownership as possession (dominum). His point was to discredit Fransiscan theologians who insisted on radical poverty. This is the rights culture that would spring full-bloom in the modern world. The problem it created was how to have community if the above take on rights is true. The fathers thought men should share as an imitation of God’s sharing his goodness with us. Augustine distinguished between two objective rights: (a) divine right, by which all things belong to the righteous, and (b) human right, in which is the jurisdiction of earthly kings (79, quoting Epistle 93). Justice for Augustine is a rightly-ordered love seen in the body politic, which would mean men loving the highest and truest good, God, for God’s sake. Therefore, the bonum commune is a sharing in a rightly-ordered love (City of God, BK 19.21). Because this sharing is spiritual, it is common and inclusive. Thus we have a republic in the truest sense of the word: res publica, public things. Conversely, a disordered love in the soul is the privatization of the good. Therefore, a disordered love will see the destruction of community. It is the regulated interaction of private spheres of degenerate freedom, secured by the protection of property and enhanced by the provision of material benefits at the hands of unscrupulous tyrants (80). Renouncing property right means that the viator is not a self-possessor, but rather is possessed by Christ and receives his powers (85). 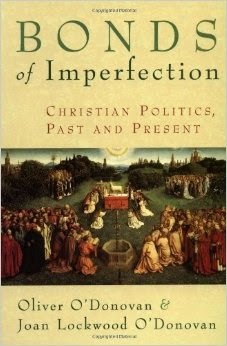 Irony: Wyclif’s reform program actually owed a great deal to Pope John XXIII’s reflections. Non-proprietary posession belonged not only to Adam’s original state, but all the way forward to the episcopolate today: this should be seen in the church militant (88). Divine lordship (dominum): per Wyclif’s predecessor, Fitzralph, God is the primary possessor and enjoyer of creation. Therefore, his giving of creation to Adam is a communication and sharing of himself, rather than a transfer of Lordship (89). For the church, for Wyclif, this is God’s gift of himself as the love of Christ and the fellowship of the Holy Spirit (2 Corinthians 13). Therefore, all of the “justified,” who coexist with Christ’s love, share (communicant) in this lordship directly from Christ. Therefore, just dominion involves rightly-ordered love towards these communicable goods, which in turn depends on true knowledge of them available in Christ.